You'll receive this task from Wyla inside Crucible Keep in the First Fires district of Defiance Bay. 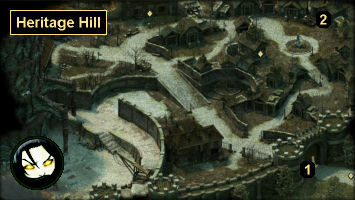 Wyla will tell you that Heritage Hill is filled with "walking, fleshing-eating corpses," and that she's lost several guards to the creatures, including one of her finest commanders. When you volunteer to look into the matter, Wyla probably won't sound too enthusiastic, but she won't try to stop you, either, and she'll give you permission to enter the district. When you arrive in Heritage Hill, the guard out front (#1) will try to stop you, but when he learns that Wyla sent you, he'll unlock the gate and allow you to go inside. You can also get past him by bribing him or by using the Might 18 dialogue option. At the end of your conversation, the gate guard will mention that one of the other guards thought she heard shouting in the northeastern part of the district. You'll find the missing guards in a mausoleum to the northeast (#2). They'll be enthralled by a banshee named Leyra -- the missing commander. Leyra won't realize that she's dead, but no matter what you say to her, she and the guards will attack you. There isn't any way to save the guards. Even if you kill Leyra first, the guards will remain hostile, and you'll have to kill them as well. Afterwards, when you return to Wyla to let her know that the missing guards are dead, she'll reward you with 1000 cp. You'll also earn a "major" reputation bonus with the Crucible Knights and a "moderate" reputation bonus with Defiance Bay.